Used for registration of single or multiple MMS members in the front rows. All persons registered for this ticket must be 2015 annual fee paid MMS members. Used for registration of single or multiple MMS members. Used for registration of single or multiple non members. "टाईमपास" चित्रपटाची "नायिका" आणि "मला वेड लागले प्रेमाचे", "ये ना पुन्हा" या गोड गाण्यांची "गायिका" अशा दुहेरी भूमिका उत्तमरित्या बजावणारी गुणी कलाकार "केतकी माटेगावकर"
आजच आपली तिकीटे खरेदी करा..
५०० डोवर रोड, सिंगापूर १३९६५१. A, B व C रांगा, सभासद ३०, पाहुणे ४०. 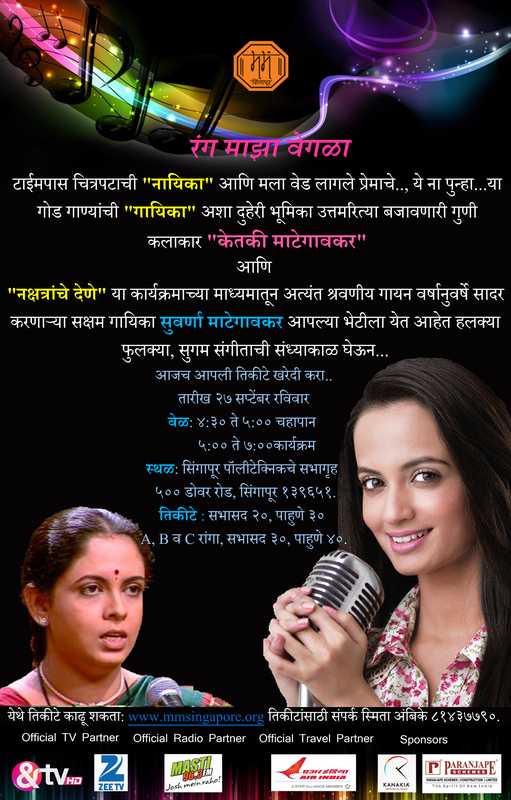 We invite you to a melodious evening full of popular songs from the well known Mategaonkar duo! Ketaki Mategoankar is a famous for ehr roles in movies like "Timepass", "Shala", "Kaaksparsha" & "Timepass 2". 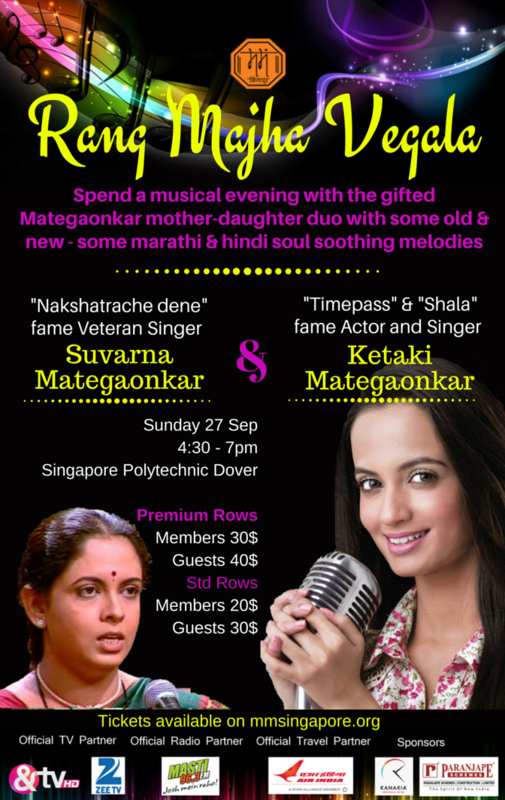 She is also a singer and has made her mark by singing popular ongs and releasing her own album ""Ketaki"
Suvarna Mategaonkar is Ketaki's mother and an established classical, semi-classical, light indian singer for years. She was a part of television programmes and in many famous concerts. They both are brining to us some old hindi, some old marathi, some new marathi classics, so we are surely in for a musical treat. Do not miss this chance to unwind in a "note(! )"worthy company.